The Phenomenon of Seafloor Spreading During the 1960s, a major scientific program was commenced to study Earth's ocean floors. This ground-breaking program yielded some astonishing things. Perhaps the most surprising of all was the discovery of seafloor spreading. It was found that most of the oceans contained Mid-Ocean Ridges, long continuous volcanic ridges where new surface was being produced by material thrusting up from below the seabed. "Sea-floor spreading is driven by crust formation along the mid-ocean ridges, meandering undersea mountain ranges that span Earth like the seams of a baseball. Oceanic crust is continually produced by magma welling up along the centerlines of the mid-ocean ridges. This new crust flows away from each ridgeline in two symmetric sheets, one on each side. The rate of sea-floor spreading resulting from this process is from 1 to 20 centimetres per year, depending on the particular mid-ocean ridge." "The Mid-Atlantic Ridge offers a particularly clear case of sea-floor spreading. About 165 million years ago, the Americas were matched to Africa and Europe like the pieces of a puzzle. Then, magma upwelling at the Mid-Atlantic Ridge began to produce oceanic crust, parting the continents to form the Atlantic Ocean. Today the Mid-Atlantic Ridge snakes down the center of the Atlantic all the way from Iceland to the Antarctic Plate and remains an active site of sea-floor spreading." "In 1968, the oceanographic drilling and coring vessel Glomar Challenger was launched on a voyage to study the geological evolution of Earth. From its platform, it was possible to lower up to 6,100 metres of pipe into the open ocean, bore into the seafloor to a depth of 762 metres, and then bring up samples (or cores) of the crust beneath the ocean." "During her fifteen years of operation, the Glomar Challenger operated in all the major oceans and seas of the world. For the geologic community, each of her voyages was the equivalent of a moon shot. The core samples the vessel retrieved were from a remote and largely unexplored portion of Earth's surface." All about MORB The drill cores retrieved gave a wholly unexpected new picture of the history of Earth's oceans. Apart from the relatively recent thin upper layers of normal oceanic detritus falling from above, the rock on the seabed was everywhere the same type of basalt, later dubbed MORB (Mid-Ocean Ridge Basalt). The fact that the composition of this MORB was everywhere practically the same was also a surprise. With normal volcanic eruptions, the composition of the lava produced usually parallels that of the surrounding rocks. Its mode of production was also new to geologists. Instead of the lava coming from individual volcanoes, it was produced like a carpet from the long slots in the middle of the ridges. The basalt could be dated using normal rock-dating techniques, and revealed an astonishing thing. All the MORB forming the base of today's oceans was less than about 180 million years old, which is fairly young in geological age. In other words, all Earth's current oceans had come into being in the last 180 million years. For comparison, Earth is believed to be about 4,600 million years old, and the Cambrian era, which marks the beginning of abundant fossiliferous life on Earth, started around 580 million years ago. Even more interesting, the age of the MORB was directly dependent on its distance from the generating slot. At the slot, new MORB was being formed, age zero. Moving away from the slot on either side, progressively older bedrock was encountered, right out to its farthest reaches on the fringes of the continents, where it was up to 180 million years old. All this information rocked the geological world. It showed clearly that the beds of the Earth's oceans had been expanding in area, continuously and regularly, over the last 180 million years. Moreover, there were no relics of older oceans visible anywhere on Earth, except as rock deposits which currently lay on the continents. The 'continental crust' was almost everywhere older than the 'oceanic crust', and the latter was everywhere of uniform composition. The new picture was of conveyor belts of 'carpet' lava, issuing continuously from 'slots' in the middle of the active mid-ocean ridges. "A dramatic proof of sea-floor spreading was discovered in the mid 1960s when data revealed alternating stripes of magnetic orientation on the sea floor, parallel to the mid-ocean ridges and symmetric across them -- that is, a thick or thin stripe on one side of the ridge is always matched by a similar stripe at a similar distance on the other side. This mirror-image magnetic orientation pattern is created by steady sea-floor spreading combined with recurrent reversals of Earth's magnetic field. Iron atoms in liquid rock welling up along a mid-ocean ridge align with Earth's magnetic field. " "When this magma solidifies into crust, its iron atoms lock into position. This solid crust flows away from the mid-ocean ridge in both directions, carrying its original magnetic orientation with it. Eventually Earth's magnetic field reverses. Previously solidified crust retains its original field state, but crust just forming along the ridge is locked into the new orientation. As crust feeds steadily and symmetrically away from the ridgeline and Earth's magnetic field reverses over and over again, a symmetric striped pattern of magnetism is created." Fig. 4. Seafloor Spreading with Magnetic Reversals (animation courtesy of the US Geological Society) (From ). The basalt stripes not only allowed good age figures to be established across the widening seafloor beds, they also indicated the directions of the north and south magnetic poles at the time of deposition (although interpretation of these vectors has not always been correct). Effects of Seafloor Expansion on Sealevels On average, any great circle drawn around the Earth will encounter two mid-ocean ridges, each expanding at 1-20 cm per year . For purposes of calculation, assume a single ridge extends right round the Earth, and its average expansion is 10 cm per year. Let's do a rough calculation on how this expansion will affect the average level of the oceans. According to published figures , the world ocean has an area of about 361 million sq km, an average depth of about 3,730 m, and a total volume of about 1,347,000,000 cu km. The seafloor expansion at the Earth's surface will be just one sign of the expansion of the Earth itself. 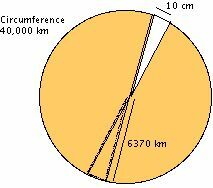 If the surface expands by a strip 10 cm wide in a great circle strip once round the Earth, the volume gained is equivalent to a wedge 40,000 km long (circumference of the Earth), 6370 km deep (radius of the Earth) and 10 cm wide (Fig. 5). Fig. 5. Calculating volume of wedge from surface to centre of a sphere. Multiplying these three figures out, and remembering that the result must be halved because the wedge has a triangular cross-section (Fig.5), with 10 cm equal to 0.0001 km, gives a volume change of 12,740 cu km. Withdrawing this much water from an ocean surface of area 361 million sq km would make it drop by 0.3529 x 10-4 km, or just over 35 mm. Of course this calculation is very approximate, and subject to many assumptions which are far from rigidly defined, but it does give some sort of basis for further examination and refinement. The actual calculation above gives too high a value, because the base of the wedge is not 40,000 km long, but tapers to a point. Nevertheless, the bulk of the volume concerned is near the surface, where the wedge base is still quite long. Expansion Equilibration On the real Earth, expansion does not open up an actual wedge, instead rock slumping and movement takes place as the Earth re-adjusts itself to a very slightly larger oblate spheroid. This adjustment, which can be called Expansion Equilibration, must take place at various rates and positions over the whole Earth. In fact this Equilibration Model appears to underlie and explain the majority of known geophysical changes. It explains gross, fast, and high-energy events such as earthquakes and tsunamis. It also explains more subtle, slower, and lower-energy events such as the formation of ocean trenches and the apparent upthrust of mountain ranges. A logically-based explanation of these geophysical changes has not, until now, achieved general acceptance. Of course the Equilibration Model is at its earliest and most preliminary position, and must undergo considerable refinement. Measurement and summation of detailed seafloor spreading figures over the whole Earth might well give a global average well below 10 cm per year. For the drop in sealevel calculated above to have meaning, the spreading events must be occurring at the seabed. This is, in fact, the case over the whole planet, except for a short transect of Iceland. While the active spreading sites at 'hot' mid-ocean ridges have been measured in some detail, there is very little information available on possible widening of 'cool' ocean trenches such as the Mariana or Aleutian Trenches. The Equilibration Model does open up the possibility, perhaps for the first time, to begin to calculate where and when pivotal world events such as major earthquakes should occur. More knowledge of rock mechanics, especially over large distances, and long periods of time, will be needed, and almost certainly the development of computer models for an expanding Earth. The Subduction Myth Readers familiar with seafloor spreading science will know that when the phenomenon was discovered, an explanation was looked for as where the new surface was ending up. The treatment above shows that it was ending up on the Earth's surface -- the surface was increasing in area each year. In fact, in concert with the increased surface, the Earth itself was expanding each year. This idea was not acceptable to traditionalists, who insisted that it was obvious the Earth could not be expanding, that went against nature or something. And so the Subduction Myth was invented. Without a shred of supporting evidence, the traditionalists decided that the extra surface must be thrust down at continental margins, disappearing below the continents, where it was recycled into new continental crust. These so-called 'subduction zones' were said to operate at oceanic trenches, many of which are at continental margins. A little thought, using the evidence given above, shows the whole subduction idea must be nonsense. Consider Fig. 2, Age patterns of the Earth's ocean beds. Laid out there is a detailed picture of the history of seafloors over the last 180 million years. It is possible to pick out a particular section of the seafloor and say, with fair accuracy, when it was formed and where it is currently positioned. Where on this picture is there any evidence of seafloor disappearing? Instead, we have the clear picture of the systematic creation of new oceans and new surface over 180 million years. Earth's current oceans cover more than two-thirds of the planet's surface, and have an average depth of about 3700 metres . To accommodate the amount of material cut away and thrust beneath the continents in the subduction concept, the continents would have had to accommodate an average of some 7400 metres of rock beneath their original levels. This clearly does not fit in with the observed positions. In fact the present average height of the continents is about 750 metres above 'sealevel'. Fixed-Earth and Expanding-Earth Theories -- Time for a Paradigm Shift? which is at http://www.aoi.com.au/bcw/FixedorExpandingEarth.htm. The stablemate article The Rising Sealevel Myth -- Proofs that ocean levels are falling, not rising, at http://www.aoi.com.au/bcw/Sealevel/index.htm, gives evidence of the fall of world sealevels over the last several millenia, based on the retreat of ancient ports from their seacoasts. It does not consider the underlying causes for this retreat, it only shows the evidence for its occurrence. 6. Volume of Earth's Oceans. http://hypertextbook.com/facts/2001/SyedQadri.shtml.